At last June’s MagNet magazines conference in Toronto, a golden panel of industry experts gathered to present a session called “Going for Gold: How to Create Award-Winning Content,” moderated by Deborah Rosser, president of Rosser & Associates. Patrick Walsh, editor-in-chief and brand manager of Outdoor Canada, winner of 21 National Magazine Awards since 1987, and former president of the NMAF. Risk and Reward: The moderator began by asking each of the panellists to present the story of a challenging piece that won a National Magazine Award, and what lessons they took from the experience. Sarah Fulford spoke about how breaking the rules helped Toronto Life to a surprise NMA win for best magazine cover of 2008. 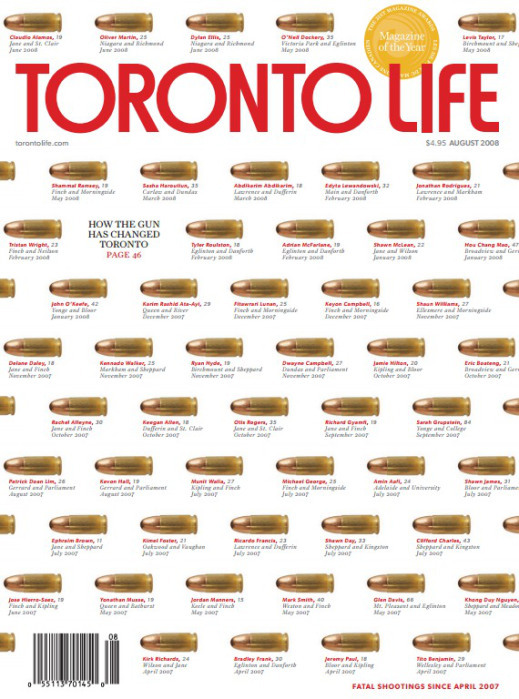 Sarah said she and her then art director Jessica Rose, whom she hired with this specific challenge in mind, took big risks on a cover about gun violence in Toronto, as they bucked the conventions for cover design with small cover lines and other elements reflecting thinking outside the box. The issue sold well on the newsstand and also impressed the NMA judges that year, as they gave it a Gold. Patrick Walsh described the story of a controversial article he commissioned about the death of a hunter in Newfoundland, called “Another Fine Day Afield.” As an editor he felt that the story hadn’t been covered well in other media, and though it would be a legal, financial and editorial challenge to pursue the story for Outdoor Canada, he decided to take the risk. The risk paid off when the magazine story he published was picked up by CBC’s The Fifth Estate and NBC’s Inside Edition, and his writer Charles Wilkins won a Gold National Magazine Award in Sports & Recreation. Carole Beaulieu also touted the benefits of taking risks and believing in the work you produce. She talked about a piece from last year she commissioned from a writer about Pauline Marois. Although Quebec news had been saturated with stories about the premier, Carole felt there was room for more if they could find the right angle and give it the right depth. 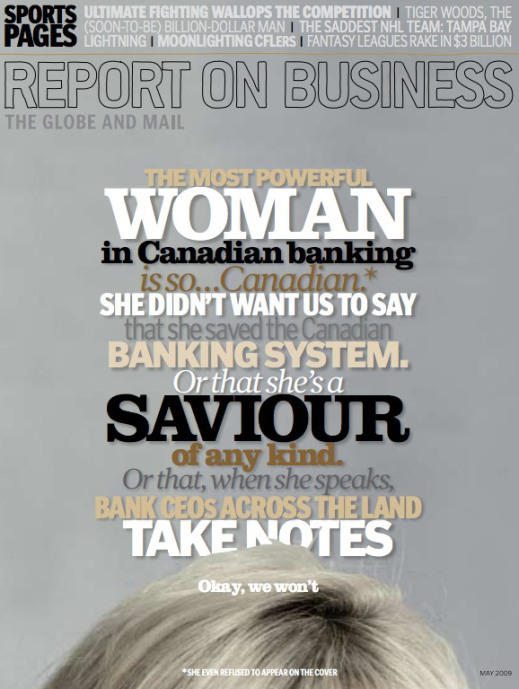 She sent her writer to spend time with Mdm Marois at her hairdresser’s, achieving a kind of intimate portrait not yet seen, and L’actualité created a newsprint insert–what it is now calling a “mini-book” and making a semi-regular feature for the magazine–to accommodate the 16-page story. And at this year’s NMAs, “L’éttoffe d’un premier ministre,” by journalist Noémi Mercier, won Gold in Profiles. Quote-Unquote: On the significance of winning a National Magazine Award and why we strive for award-winning content. The Bottom Line: The moderator asked each panellist to distill one piece of advice for winning a National Magazine Award. Domenic: Strive for strong collaboration between editorial and art in creating your content. Success is a product of a strong team. Carole: Don’t take things too seriously. Trust your instincts and never give up on a great story. Sarah: The most successful pieces are the ones where the creators were passionate and took risks. Patrick: Be strategic, because the more you enter the more you are likely to win. If your aim is to win awards then enter as much as you can. David: Advice to writers: write well. And advice to editors: hire writers who write well. In Summary: Accept challenges, take risks, think differently, be passionate, find (or be) the best creator, work together, never give up on a good story, believe in your work and enter as much as you can. That, and always strive for the ‘wow’ factor! On behalf of the Canadian magazine industry, thank you to the panellists for sharing your wisdom.